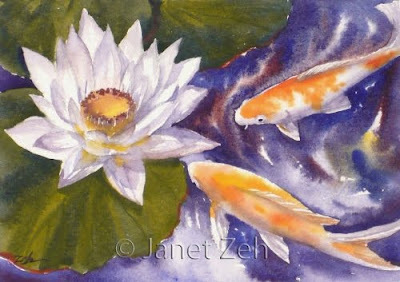 This twelfth painting of koi focuses on the beautiful white waterlily which takes center stage. I really enjoy these koi paintings especially painting the water. By wetting the paper and dropping in color, I never really know how it will turn out until the paint is dry. See more of my artwork at zehoriginalart.com. Thanks for stopping by today to visit the lily pond.